I had such a lovely weekend visiting my older daughter at college. I was sitting with my husband and all three of the kids talking about Thanksgiving. You all know how much I adore planning this holiday and having a full house all day long. My favorite part is when the kids help me in the kitchen, especially all three of them together with me at the same time. I just live for that. And this is why my Thanksgiving menu grows each year. But she’s right. Even I look forward to taking a cooking break at noon with a hot mug of bright orange, silky butternut squash soup and a mini cornbread muffin. Nothing says Thanksgiving (and fall) quite like it. When I was first married and the seats at our Thanksgiving table were few, I used to serve the soup as a first course. It was easy to do and I didn’t prepare so many side dishes back then either. Once our numbers edged past 16, serving a first course seemed a little difficult. It was around the same time that the kids were old enough that they needed a little something to eat around noon to tide them over until our 4:00 dinner time. That’s when the soup was moved to a noon lunch break. If I do say so myself, I think it’s the best butternut squash soup I’ve ever had. And there’s no cream or milk or flour. It’s nice and thick from just butternut squash. There is a very long roasting time involved, but I assure you it is worth it and it’s all hands-off time. The squash develops a very rich flavor this way and a bonus is that you can avoid doing any peeling and cubing of the squash beforehand. The flesh becomes so meltingly tender, that all you need to do is scoop it out of the skin. So easy! Even though I make this every year for Thanksgiving, I have also made it for fall and winter entertaining and Sunday dinners. The soup is perfect made a day ahead and it freezes very well. It truly is the best butternut squash soup! Cut the squashes in half lengthwise. Scoop out the seeds and discard. Place the squash halves cut side up in a roasting pan. Divide the butter and maple syrup evenly amongst the squash cavities. 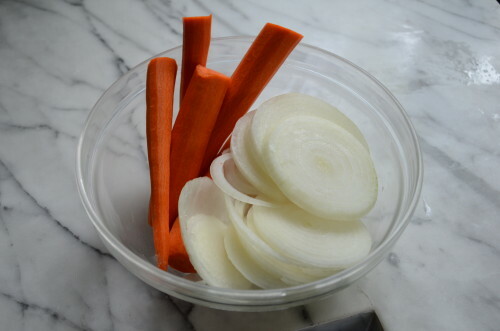 Arrange the carrot and onions slices around the squash. Pour 2 cups of stock in the pan and cover tightly with foil. Bake for 2 hours. Remove the pan from the oven and allow the vegetables to cool slightly or enough that you can handle them. Scoop the squash pulp from the skins and transfer to a large soup pot. Add the carrots, onions and cooking liquid from the pan. Add the remaining 8 cups of chicken stock to the pot with cayenne and salt to taste (I usually add 1 Tablespoon when I use unsalted stock.) Stir well and bring to a boil. Lower heat and simmer, uncovered for 10 minutes. 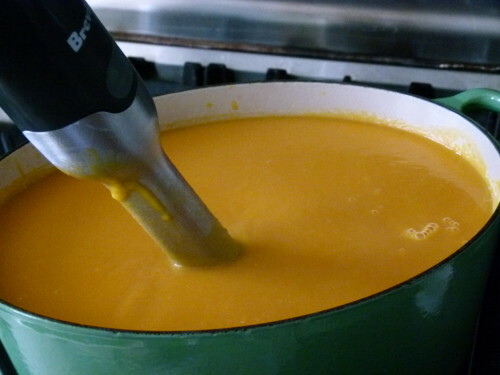 Puree the soup until smooth in the pot with an immersion blender or in batches in a blender. Taste for seasonings. Soup can be made up to 2 days ahead and reheated. My daughter is on a very restricted diet and cannot have any added sugar. My son, however, LOVES this soup. Do you think it would still be ok without the maple syrup? Pamala thank you for this fantastic recipe. Since it is just for me and my wife, I half the recipe. It is my favorite soup to make. I can take a nap while the squash is roasting. The aroma of the squash, onion, and carrots roasting puts the senses on high alert. When the soup is done the flavor doesn’t disappoint. We like a little more cayenne in ours. I use a quarter teaspoon of cayenne. Also, I like to put some toasted walnut pieces in the soup bowl, then ladle the soup. Think I am going to have another bowl now. Thank you once again for this delicious and easy to make recipe. This soup was fantastic!! It was a huge hit at my Thanksgiving feast! I know it serves 12 but what is considered a serving?? 1 cup? 1- 11/2 cups is a serving. Glad you enjoyed it! SOrry for the late response! I tend to prefer chicken stock, but veggie stock is great, too! Hi Pamela! Love this soup recipe so much—wondering if you think it would work to attempt a slow cooker version with it? Hmmmm, I wonder if the same depth of flavor would develop with the squash. I don’t see why not! I would do the squash in the slow cooker and then after 5 hours, scoop out the flesh and then proceed with the rest of the recipe and cook for another hour or so. Is it 8 lbs of whole squash or after I scoop it out. I can’t really measure it. So how many whole squash should I use? Weigh the squash at the market. You want 8 pounds of whole squash before cooking. 1 large squash is about 4 pounds. i bought 2-16oz tubes of precut cubed squash, which is obvi 2lbs- how much more do you think i need? 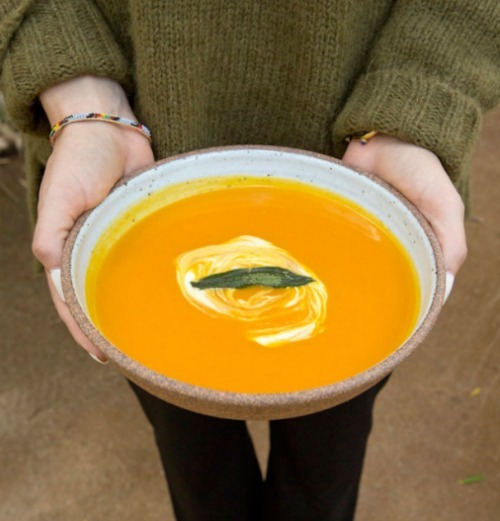 Hi Maggie, This recipe calls for slow roasting butternut squash halves which give an incredibly deep flavor to this soup. That said, if you want to make this with precut cubes, I would just follow the steps outlined in my Sweet potato-coconut soup recipe here: https://pamelasalzman.com/sweet-potato-coconut-soup/ Also note that this recipe makes a lot of soup, serving 12 people. If you’re looking to make a huge batch, then I would use 7 pounds of precut squash. I have not tried this recipe with precut squash, so I am really guessing here. You can also check the comments to see if anyone has made this with precut squash. I am making this soup today and wondered when and ho w much you added the coconut milk? If you decide to add coconut milk, I would do it when you add the stock at the end. Just a 1/2 cup is all you need to add some richness. I am planning to purchase cubed butternut squash to save a little time. How many pounds of pre-cut squash equates to 8 pounds of whole squash? Thank you — can’t wait to make this. Hi Denise, This recipe as written doesn’t work with precut squash. If you want to make it with precut squash, follow the directions for the sweet potato-coconut soup. 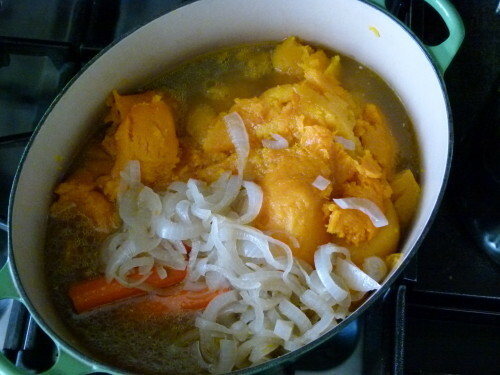 Meaning, saute onions in a soup pot with the butter, add the squash cubes, carrots, maple syrup, salt, and stock and bring to a boil, lower to a simmer and simmer until the squash and carrots are tender. Then puree. It won’t take more than 30 minutes, I assume. I know precut squash is a huge time-saver, but the squash develops a much deeper flavor when roasted in halves for a long time. It will still turn out great, but just wanted to put that out there. Hope that helps! I wanted to make a butternut soup and looked at a few recipes. Eventually I decided to use yours..the slow cook was attractive…put in the oven and forget about it for 2 hours. Thanks, Premi. I agree that the slow roasting develops a lovely flavor. And a little cream makes this soup even more luxurious! This recipe sounds delicious! Have you ever added apples? Curious to know what you would have done. Thanks Pamela – another amazing recipe!!! Hmmmmm, that’s a tough one. Technically, if it has animal products in it, the FDA says not to leave it at room temp for more than 2 hours. Personally, I have left a giant stockpot of stock out to cool overnight on my counter many times and then just refrigerate it. If the kitchen is cool, I think you’re probably fine. But I can’t really advise anyone to do that since bacteria could have been created that may not have been killed even by boiling it. My point is — you’re taking a risk for sure, but I have taken that risk many times and been fine. Another amazing recipe! I made this for the first time last night for my mother-in-law, who is in town and who is a great cook. I’m always slightly nervous to cook for her, but I’ve made a lot of your recipes and they all have been delicious, so I didn’t even think twice about serving something I’ve never made before. This soup is so delicious. It got rave reviews- big smiles and empty bowls! It’s so simple to make and the flavor from the roasting makes it unreal; and I just love that it’s so thick without cream or flour. Will definitely be making again and again. Thanks again for your delicious recipes and sweet advice and stories! I really love your blog. Amy, you are so kind and I am sure quite the cook yourself! I’m so happy the soup was a success for you. I hope you have a wonderful Thanksgiving! This recipe is amazing for so many reasons. First of all, it tastes absolutely delicious – the butter and maple syrup make it sweet and yummy and balance out the vegetables nicely. Secondly, it is easy and hardly requires any prep time. What I loved most of all is that my 9-year-old son enjoyed it as much as I did! He even asked for his own bowl after tasting mine. I made this tonight and it was a huge hit! Thank you so much for sharing your recipe and helpful photos! I will definitely make this again – soon! If I can’t make this much because I don’t have a pot large enough, can I just halve the recipe or make 3/4 of it instead? I’m assuming that I would just cut all the ingredients accordingly… Also, if I freeze some of the soup, how long is it good for? Thanks! Of course! I halve it all the time if I’m making it for just my family :). Halve all the ingredients. You can freeze it for up to 3 months. I have never made butternut squash soup before. Your recipe was so easy! And it was soooo good! I was able to use my homemade stock in the freezer which gave it such a rich flavor. I am going to try the delicata squash recipe with the relish this weekend. I too, love the delicata squash. I love your blog and hope to attend one of your cooking classes. My family and I switched over to a “no processed food” way of life a year ago. I loved cooking before and now I can’t do it enough. Knowing (almost) everything my kids are eating makes my heart and mind happy. Thank you so much for your dedication to good food and nutrition. I just made this soup and it is so delicious!! It is the first butternut squash soup recipe that I haven’t had to doctor up. As always thank you so much! I’d like to make this for a family who is vegan. What would you suggest as a sub for butter? Coconut oil? thanks for keeping me inspired! Yes, coconut oil would be great! You can also use Earth Balance, but coconut oil is more natural. I have made this with veggie stock and it turned out great. Can you use fresh, cubed butternut squash and if so, how much would you need? Yes, but that is a completely different recipe with a different result. In that case, just go to my sweet potato-coconut soup recipe and follow those instructions but with the ingredients from this recipe. It will turn out fine, but this method of slow roasting the squash will give you a much deeper (and better) flavor. Plus, you don’t have to bother peeling and cubing the squash. But I don’t know how many cups 8 pounds of squash would yield. I looked it up and got 5 different answers from 5 different sites. Sorry! 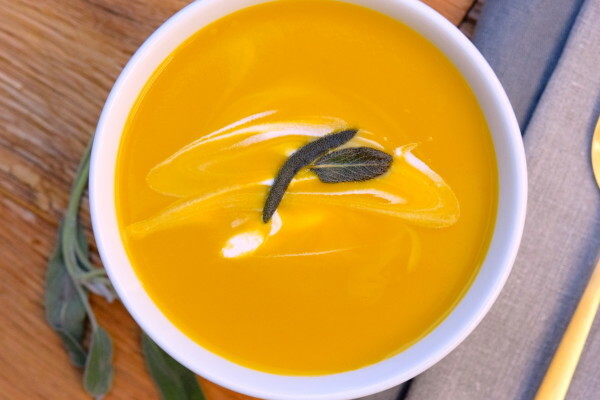 What an easy way to make butternut squash soup – I am definitely going to make this! Thanks Pamela. Glad you’re going to give it a try! Can’t wait to try this! 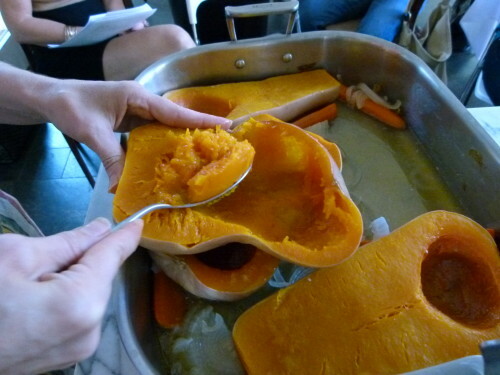 When you say wash the squash well, do you use soap and water or just water? I have made this soup many times and it never fails to please. In fact, I was already planning to make it today for our company dinner tonight. It is a fabulous autumnal dish…not to mention so healthful for us. Thumbs up all around! This looks delicious! I’m always looking for healthy recipes to repost on my site. I will definitely give this one a try!